Collectors may sometimes be viewed as eccentric hoarders, but they’re having the last laugh. Knight Frank’s Luxury Investment Index reveals that passion-driven investments have significantly outperformed more traditional assets, such as the FTSE 100 or even London, New York and Paris property. Stamps have more than trebled in value. One particularly sought-after example, Sweden’s tre skilling banco, which was wrongly printed on an amber background rather than the customary blue in 1855, sold in 2010 for £1.7 million. ‘Stamps are quietly building a following among wealthy investors, many of whom are not actually collectors,’ reports Andrew Shirley of Knight Frank. The ultimate in collecting indulgence-classic cars- produced what Dietrich Hatlapa, founder of Historic Automobile Group International, calls ‘a turbo-charged performance’, even though ‘only the most desirable marques and models will have done this well’. 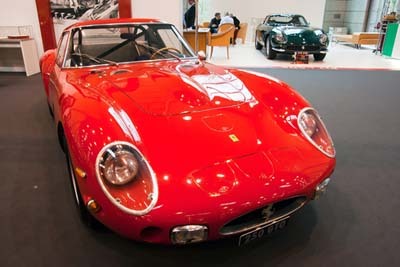 Last June, a 1962 Ferrari 250 GTO made history when it sold for $35 million (£23.2 million), having been bought for $3.5 million (£2.3 million) 16 years earlier. 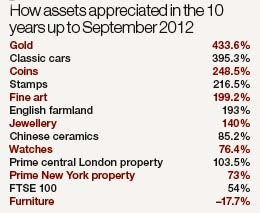 The only asset to have performed better is gold. Although Liam Bailey of Knight Frank advises that ‘values can fall quickly’, let’s face it, surely an old Aston Martin beats a pile of shiny ingots any time?